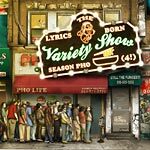 The fourth installment of the official mixtape series, The Lyrics Born Variety Show Season Pho features exclusive tracks you won't hear anywhere else, superstar guests, remixes, mash-ups and more. Guest artists include Joyo Velarde, Trackademicks, Lateef the Truthspeaker and Clyde Carson. Also appearing on tracks with LB: J-Boogie, Kasabian, The Bamboos, Soulico, Dosmoccos, Eric Legnini Trio and The Mighty Underdogs. Plus exclusive material such as LB's first ever spoken word track and sneak peaks from his 2010 album, ''As U Were''! Two bonus tracks are not on the digital release.